While not quite chart junk, its clear message is an illusion. The x-axis is not at zero, which exaggerates the change. 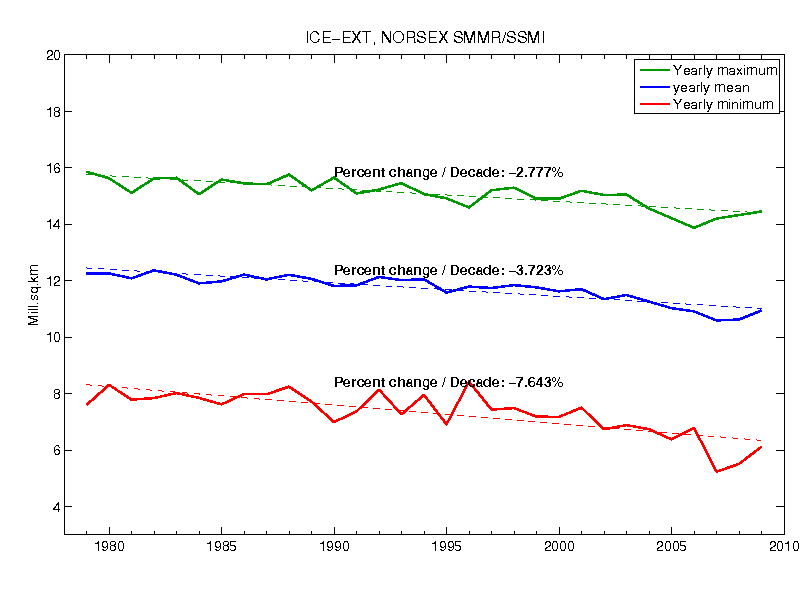 The ice extent range (y-axis) is only 12% over this 31 year period. The bold blue trend line creates a strong bias, forcing the interpretation. In fact the 2010 value is aprox the same as that of 1996. Flat for 14 years. Looking at a graph of half this dataset (1995-2010) shows no obvious trend. The small sample of 32 points tells us little, esp given natural long cyclical trends. Esp data starting in the cold 1970’s. The human eye is not good at detecting trends. Which is why we have tests of statistical significance, the only reliable way to determine trends with serially correlated data like this. These give more balanced perspectives, showing the brief data history (brief when looking at climatic trends), and the scale of the decline. The IARC-JAXA Information System (IJIS) is a geoinformatics facility for satellite image analysis and computational modeling/visualization in support of international collaboration in Arctic and global change research at the International Arctic Research Center in corporation with the Japan Aerospace Exploration Agency (JAXA). The red line is 2010. 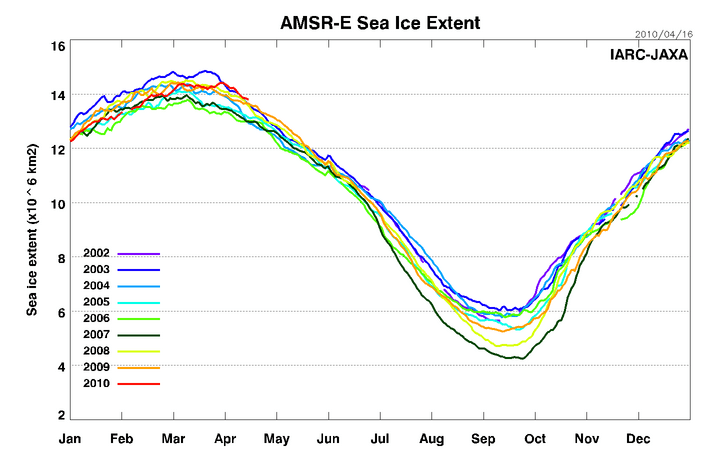 The melt has not yet begun, so the sea ice extent remains large. 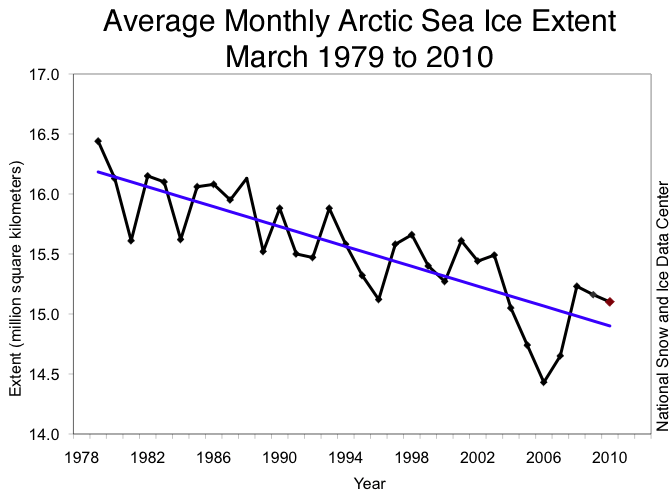 This graph can be found here; data through 16 April 2010. The Arctic Regional Ocean Observing System (Arctic ROOS) has been established by a group of 14 member institutions from nine European countries working actively with ocean observation and modelling systems for the Arctic Ocean and adjacent seas. This graph can be found here; it shows annual data through 2009. “The Changing Arctic“, George Nicolas, Monthly Weather Review, November — “so little ice as never before been noted. … Many old landmarks are so changed as to be unrecognizable. Where formerly great masses of ice were found there are now often moraines, accumulations of earth and stones. Note the date of this article. “Meteorological trends (1991-2004) at Arctic Station, Central West Greenland (69º15′N) in a 130 years perspective“, Birger U. Hansen, Bo Elberling, Ole Humlum & Niels Nielsen, Danish Journal of Geography, volume 106(1), 2006 – The arctic’s weather is changing in ways similar to that of the past 130 years. “Impure as the Driven Snow“, Scientific American, 8 June 2007 — “Soot is a bigger problem than greenhouse gases in polar meltdown.” This discusses “Present-day climate forcing and response from black carbon in snow”, Mark G. Flanner, Charles S. Zender, James T. Randerson, and Philip J. Rasch, Journal of Geophysical Research, June 2007 — Abstract. “NASA Still Spreading Antarctic Worries“, Steve Goddard, Watts Up with That, 3 February 2010 — The Antarctic data suggests these fears are without foundation (unlike the Arctic, where there are signs of warming). This world would be drowned? Yes, that’s exactly the reaction of many on the Left to the endless series of predictions of climate doom (except that they’re serious). Comments on Leftist websites frequently have casual mention of humanity’s certain doom. I find it chilling to read. See examples here.